LuminTech is a new decorative concrete product offering by Chryso Southern Africa that adds a luminous glow to concrete surfaces after dark. The product offers exciting new possibilities for architects, landscapers and homeowners. The product comprises a variety of different luminescent particles that are applied to the surface and incorporated into the concrete skin. During the day, the particles absorb natural and artificial UV radiation and then release the energy to illuminate the treated areas. “This innovative technology can be used to illuminate and enhance the architectural lines of an urban building at night, highlight a domestic terrace or garden pathway or the edges of a swimming pool. The intensity of the illumination depends on the volume of particles scattered on the concrete skin. Available in four colours, the particles are ideal for outdoor use as they are not epoxy-based,” says Michelle Fick, Executive Relationship and Project Manager for the Chryso Southern Africa Group. LuminTech is an environmentally-friendly light source as its particles are sourced from composite recycled material and natural mineral pigments. It is also durable as its luminosity does not deteriorate over time. 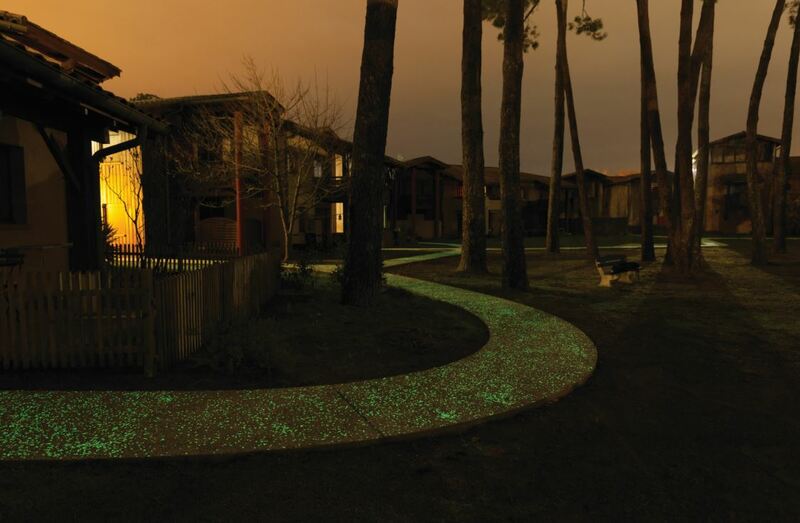 “LuminTech’s glowing appearance can generally be seen for more than 10 hours after dark and can be used as luminous nocturnal marking in lowlight areas or even replace electric lighting on cycle paths, for example. The luminous concrete marking enhances quality of life as it clearly defines spaces, making it easier for users to find their way in the dark,” says Michelle. LuminTech should ideally be used on exposed aggregate concrete in conjunction with Chryso’s Deco Lav water-based surface retarder. The luminous particles are also suitable for polished concrete surfaces although this application is not widely used. For more information, contact the Chryso via http://za.chryso.com.